The 85-gallon open-head salvage drum and barrel is a sturdy and versatile unit that can be used with a variety of materials and in many different settings. Made from high-quality carbon steel, the open-head salvage drum and barrel meets the design and construction requirements set by the UN for these salvage, storage and shipping units. With a grey exterior and bright red labels that are easily readable and displayed in two languages, these drums have a UN rating of 1A2/X440/S for solids and 1A2T/Y320/S for liquids. This means the open-head salvage drum and barrel can be used for a variety of different hazardous substances. To place an order or to learn more about UN ratings on any salvage drum, contact Container Distributors Inc. today at 800-366-5098. 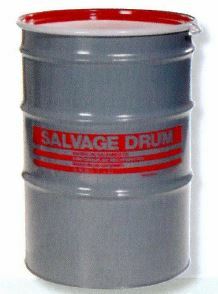 The open-head plastic salvage drum and barrel is easy to use, easy to store and offers a durable option for shipping. Made from thick, high-quality plastic, the open-head plastic salvage drum and barrel meets UN design and construction parameters for plastic drums. New overpack drums and barrels are also available, made to withstand conditions in many different environments – indoors and outside – helping to maintain the integrity and safety of materials inside. 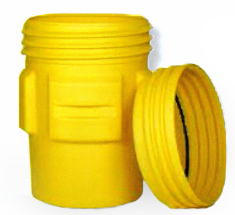 The plastic is weather and chemical resistant and the bright yellow plastic makes them highly visible and will allow any labels on the drum to be easily read. The screw-top lid keeps materials inside secure and prevents accidental spills. To order an open-head plastic salvage drums or overpack drums and barrels, or to learn more about other storage or shipping containers for hazardous materials, contact Container Distributors Inc. at 800-366-5098.